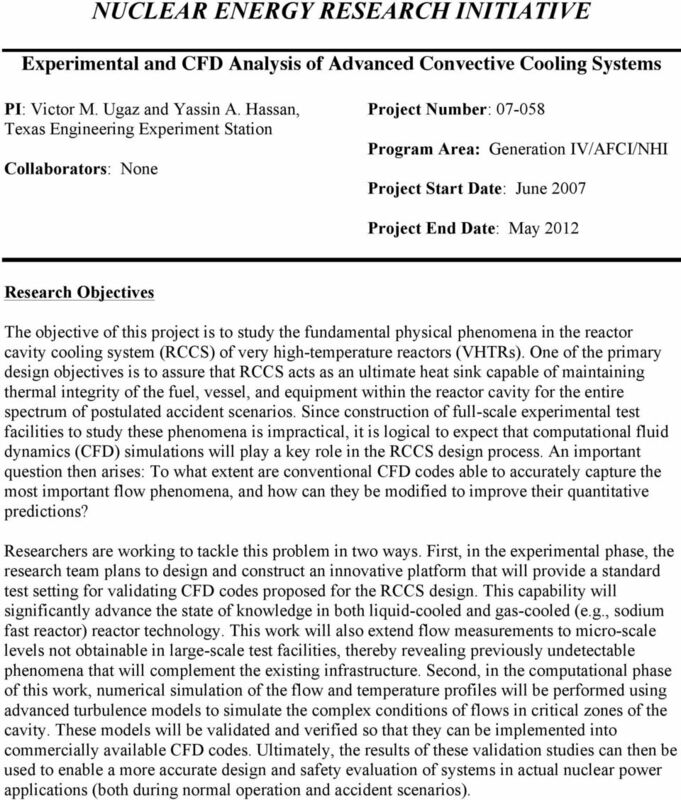 Download "NUCLEAR ENERGY RESEARCH INITIATIVE"
1 NUCLEAR ENERGY RESEARCH INITIATIVE Experimental and CFD Analysis of Advanced Convective Cooling Systems PI: Victor M. Ugaz and Yassin A. Hassan, Texas Engineering Experiment Station Collaborators: None Project Number: Program Area: Generation IV/AFCI/NHI Project Start Date: June 2007 Project End Date: May 2012 Research Objectives The objective of this project is to study the fundamental physical phenomena in the reactor cavity cooling system (RCCS) of very high-temperature reactors (VHTRs). One of the primary design objectives is to assure that RCCS acts as an ultimate heat sink capable of maintaining thermal integrity of the fuel, vessel, and equipment within the reactor cavity for the entire spectrum of postulated accident scenarios. Since construction of full-scale experimental test facilities to study these phenomena is impractical, it is logical to expect that computational fluid dynamics (CFD) simulations will play a key role in the RCCS design process. An important question then arises: To what extent are conventional CFD codes able to accurately capture the most important flow phenomena, and how can they be modified to improve their quantitative predictions? Researchers are working to tackle this problem in two ways. First, in the experimental phase, the research team plans to design and construct an innovative platform that will provide a standard test setting for validating CFD codes proposed for the RCCS design. This capability will significantly advance the state of knowledge in both liquid-cooled and gas-cooled (e.g., sodium fast reactor) reactor technology. This work will also extend flow measurements to micro-scale levels not obtainable in large-scale test facilities, thereby revealing previously undetectable phenomena that will complement the existing infrastructure. Second, in the computational phase of this work, numerical simulation of the flow and temperature profiles will be performed using advanced turbulence models to simulate the complex conditions of flows in critical zones of the cavity. These models will be validated and verified so that they can be implemented into commercially available CFD codes. Ultimately, the results of these validation studies can then be used to enable a more accurate design and safety evaluation of systems in actual nuclear power applications (both during normal operation and accident scenarios). 2 Research Progress Efforts during this project have focused on parallel tracks of experiments and coordinated computational simulations. The experimental phase has consisted of performing a complete series of flow characterization studies in our RCCS test facility (Fig. 1). The key features of the test facility include a vessel made of copper with integrated internal electrical heaters. The vessel incorporates a flange for connection of the upper and lower sections of the pressure vessel, just as in the full-scale system. An array of 20 thermocouples are positioned on the vessel for surface temperature measurements. The external enclosure (resembling the RCCS concrete walls) is constructed of glass to permit flow visualization, and stainless steel rising pipes (i.e., standpipes) were placed inside the cavity. A movable rack with 30 thermocouples is used to measure the axial temperature profile inside the cavity. This allows temperature measurements to be performed at various radial positions from the vessel wall. The air in the region between the vessel and the standpipes is at ambient pressure. Each standpipe is connected to a different pump to permit independent flow control (either air or water can be used), and the hydraulic circuit incorporates a flow meter and a nozzle for tuning the flow. In our initial studies, the cavity is divided into four regions along the axial direction. The flow in each zone is captured with a high speed camera at 200 fps to enable visualization of the flow field inside the cavity using zinc stereate tracking particles (Fig. 2). Measurements are made at steady state, and velocity field, vorticity field and error analysis have been performed. These measurements show that heat is exchanged from the reactor vessel to the cavity through radiative transfer and natural convection processes. Under the conditions probed in our experiments, the data suggest that 65% of the heat is carried by radiative transfer while 35% carried by natural convection. The cooling pipes remove 30% of the heat inside the cavity. Results are obtained using grey surface approximation, cylindrical symmetry, and averaged fluid properties. The averaged Rayleigh number Ra ~ 3.87 x 10 5 corresponds to fully turbulent flow. These results shows complexity the of the heat transfer phenomenology in the RCCS, and illustrate the coupling between the temperature profile and the vorticity field. Overall, the test facility provides a new advanced platform to study heat transfer in enclosed cavities with realistic boundary conditions. Fig. 1. Overview of experiment facility design. Fig. 2. Experimental measurements of velocity field near the vessel sidewall. 3 We also performed experiments to explore the effects of graphite dispersion and deposition into the reactor cavity of a VHTR following a loss of coolant accident. These efforts consist of performing coordinated particle image velocimetry studies of the air flow in the cavity during graphite dispersion. 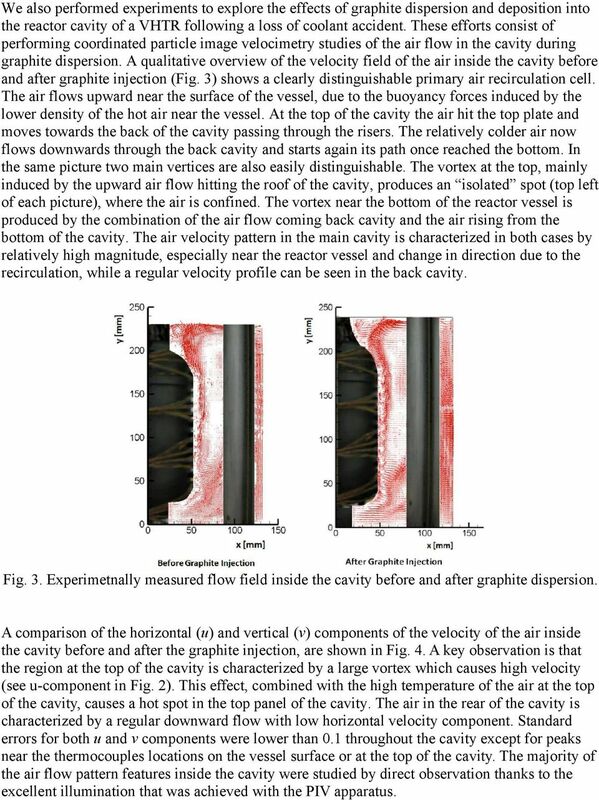 A qualitative overview of the velocity field of the air inside the cavity before and after graphite injection (Fig. 3) shows a clearly distinguishable primary air recirculation cell. The air flows upward near the surface of the vessel, due to the buoyancy forces induced by the lower density of the hot air near the vessel. At the top of the cavity the air hit the top plate and moves towards the back of the cavity passing through the risers. The relatively colder air now flows downwards through the back cavity and starts again its path once reached the bottom. In the same picture two main vertices are also easily distinguishable. The vortex at the top, mainly induced by the upward air flow hitting the roof of the cavity, produces an isolated spot (top left of each picture), where the air is confined. The vortex near the bottom of the reactor vessel is produced by the combination of the air flow coming back cavity and the air rising from the bottom of the cavity. The air velocity pattern in the main cavity is characterized in both cases by relatively high magnitude, especially near the reactor vessel and change in direction due to the recirculation, while a regular velocity profile can be seen in the back cavity. Fig. 3. Experimetnally measured flow field inside the cavity before and after graphite dispersion. A comparison of the horizontal (u) and vertical (v) components of the velocity of the air inside the cavity before and after the graphite injection, are shown in Fig. 4. A key observation is that the region at the top of the cavity is characterized by a large vortex which causes high velocity (see u-component in Fig. 2). This effect, combined with the high temperature of the air at the top of the cavity, causes a hot spot in the top panel of the cavity. The air in the rear of the cavity is characterized by a regular downward flow with low horizontal velocity component. Standard errors for both u and v components were lower than 0.1 throughout the cavity except for peaks near the thermocouples locations on the vessel surface or at the top of the cavity. The majority of the air flow pattern features inside the cavity were studied by direct observation thanks to the excellent illumination that was achieved with the PIV apparatus. 4 Fig. 4. Horizontal (u) and vertical (v) components of the air velocity before and after graphite injection. 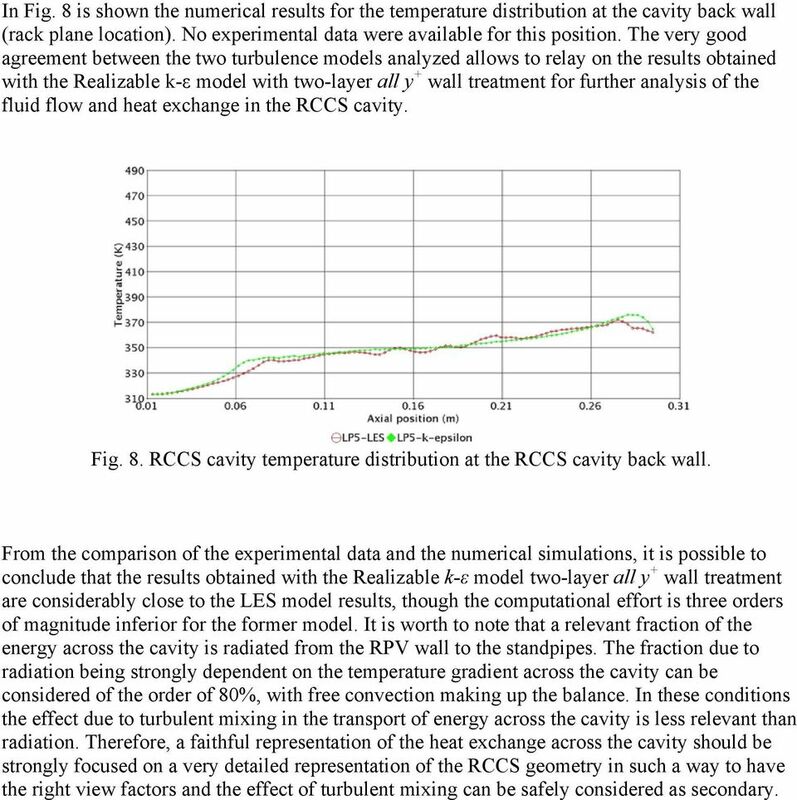 The corresponding CFD calculations performed in the computational component of the project show good agreement with the experimental data for the temperature distribution in the RCCS cavity region (Fig. 5). 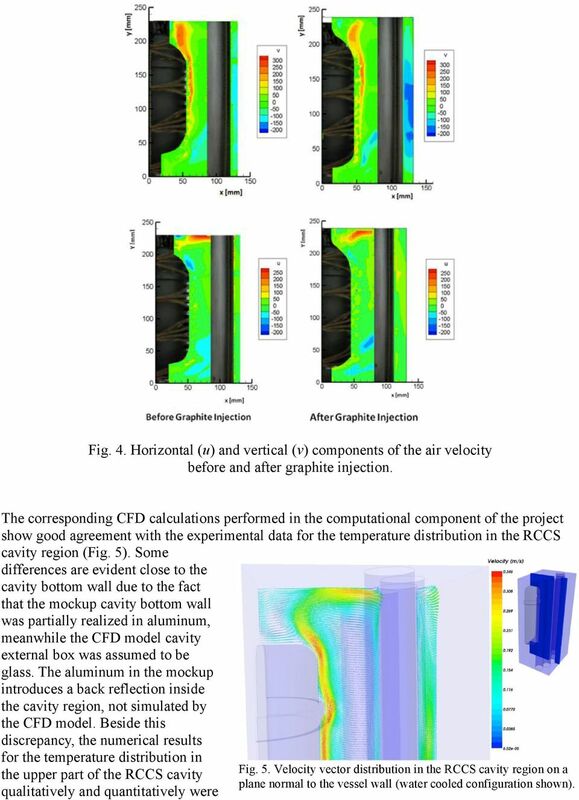 Some differences are evident close to the cavity bottom wall due to the fact that the mockup cavity bottom wall was partially realized in aluminum, meanwhile the CFD model cavity external box was assumed to be glass. The aluminum in the mockup introduces a back reflection inside the cavity region, not simulated by the CFD model. Beside this discrepancy, the numerical results for the temperature distribution in the upper part of the RCCS cavity qualitatively and quantitatively were Fig. 5. Velocity vector distribution in the RCCS cavity region on a plane normal to the vessel wall (water cooled configuration shown). 5 in good agreement with the experimental data. One strength of CFD codes is their ability to simulate radiation heat exchange phenomena in very complex geometries, where the determination of view factors represents the main problem for analytical solution of the problem. The numerical analyses performed on the RCCS with water-cooled and air-cooled configurations allowed us to address the better performance of the former respect to the latter in reducing the stress on the cavity concrete walls. The sensitivity study performed over different vessel wall temperature distributions provides a general idea of the cavity wall temperatures during the phases of a pressurized conduction cooldown (PCC) accident scenario. The analyses showed that, in the critical stage of the transient, the cavity wall peak temperature might exceed the design limits for the air-cooled configuration; meanwhile the water-cooled configuration provides a more efficient cooling, with the cavity wall peak temperature below the design limits even if more arduous conditions are assumed throughout the transient evolution. Finally, we performed a scaling analysis to address the distortions introduced by the experimental facility and CFD model developed respect to the real plant RCCS configuration. 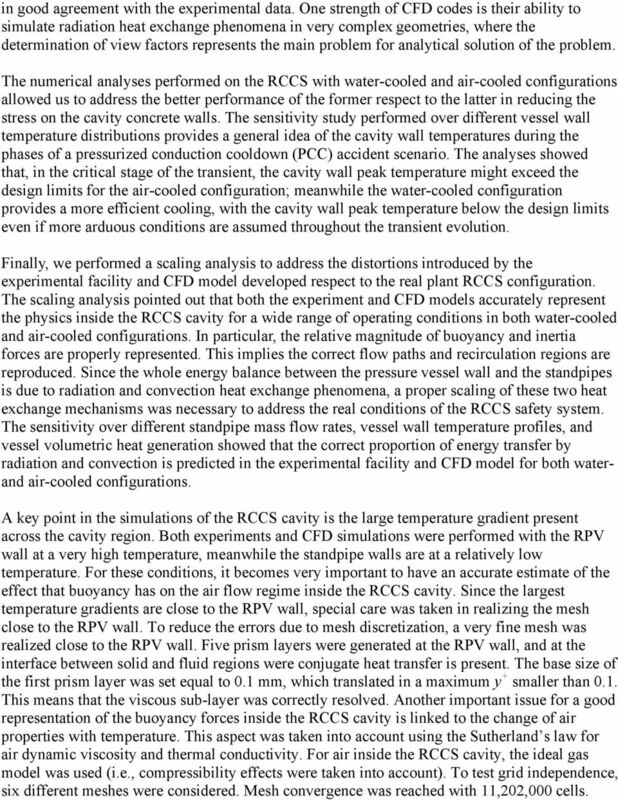 The scaling analysis pointed out that both the experiment and CFD models accurately represent the physics inside the RCCS cavity for a wide range of operating conditions in both water-cooled and air-cooled configurations. In particular, the relative magnitude of buoyancy and inertia forces are properly represented. This implies the correct flow paths and recirculation regions are reproduced. Since the whole energy balance between the pressure vessel wall and the standpipes is due to radiation and convection heat exchange phenomena, a proper scaling of these two heat exchange mechanisms was necessary to address the real conditions of the RCCS safety system. 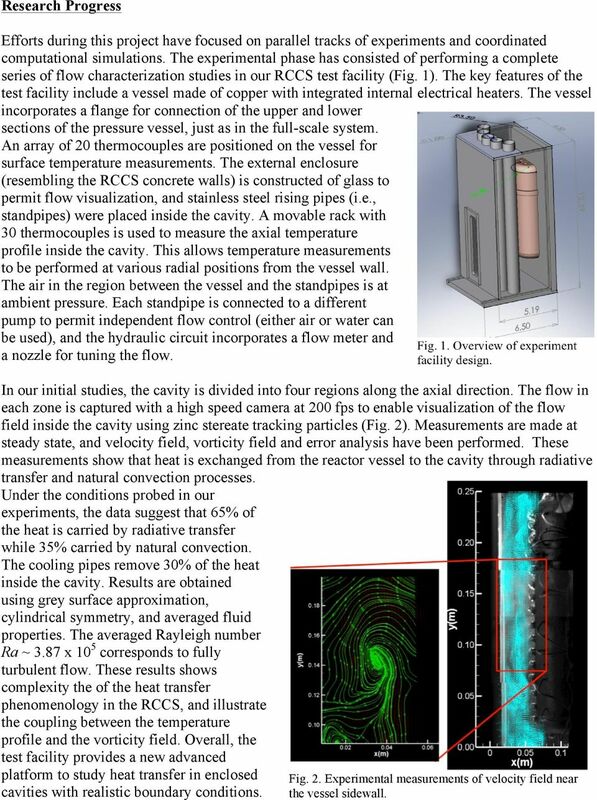 The sensitivity over different standpipe mass flow rates, vessel wall temperature profiles, and vessel volumetric heat generation showed that the correct proportion of energy transfer by radiation and convection is predicted in the experimental facility and CFD model for both waterand air-cooled configurations. A key point in the simulations of the RCCS cavity is the large temperature gradient present across the cavity region. Both experiments and CFD simulations were performed with the RPV wall at a very high temperature, meanwhile the standpipe walls are at a relatively low temperature. For these conditions, it becomes very important to have an accurate estimate of the effect that buoyancy has on the air flow regime inside the RCCS cavity. Since the largest temperature gradients are close to the RPV wall, special care was taken in realizing the mesh close to the RPV wall. To reduce the errors due to mesh discretization, a very fine mesh was realized close to the RPV wall. Five prism layers were generated at the RPV wall, and at the interface between solid and fluid regions were conjugate heat transfer is present. The base size of the first prism layer was set equal to 0.1 mm, which translated in a maximum y+ smaller than 0.1. This means that the viscous sub-layer was correctly resolved. Another important issue for a good representation of the buoyancy forces inside the RCCS cavity is linked to the change of air properties with temperature. This aspect was taken into account using the Sutherland s law for air dynamic viscosity and thermal conductivity. For air inside the RCCS cavity, the ideal gas model was used (i.e., compressibility effects were taken into account). To test grid independence, six different meshes were considered. Mesh convergence was reached with 11,202,000 cells. 6 The presence of stratification regions in the bottom part of the RCCS cavity with air almost at stagnant conditions makes it very questionable the use of first-moment closure turbulence models such as the Realizable two-layer k-ε model for solving the Navier-Stokes equations closure problem. On the other hand, in the upper part of the cavity the air is expected to be in turbulent conditions. Therefore, the flow conditions in the cavity region cannot be assumed as laminar. This is the main reason why LES was used as turbulence model to address the effect of turbulent mixing in the RCCS cavity. The advantage of using LES against first or second-order closure models is due to the fact that using LES the large structures of the flow (i.e., the larger eddies) are correctly represented, while only the smaller structures (i.e., small eddies) are modeled. Since most of the energy dissipated through turbulence is contained first in the larger eddies, this implies that using LES with a sufficiently fine domain discretization it is possible to determine almost completely the effect of turbulence on the main flow. How the energy is dissipated by smaller eddies is relatively important and this effect can be modeled using Smagorinsky or Wale subgrid scale models. Due to the absence of near-wall damping, the Wale subgrid scale model is more suited to large-scale parallel computation on complex geometries. 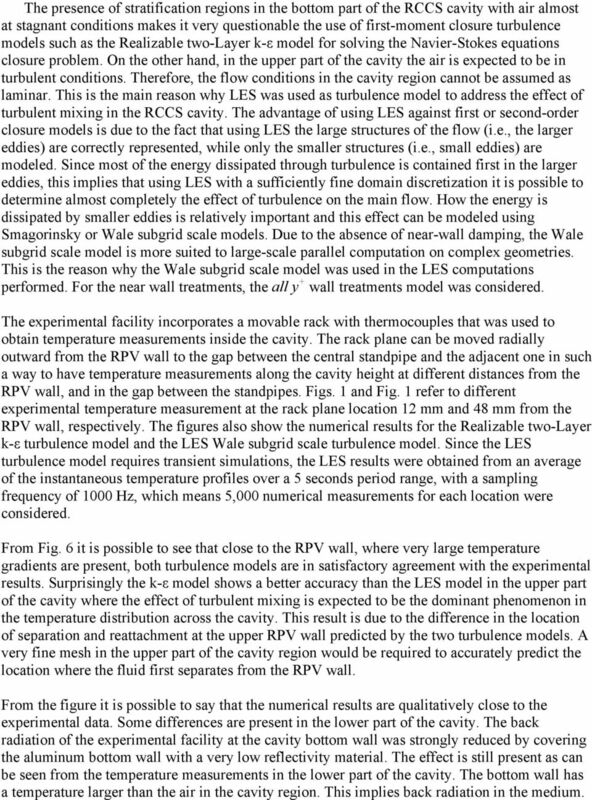 This is the reason why the Wale subgrid scale model was used in the LES computations performed. For the near wall treatments, the all y + wall treatments model was considered. The experimental facility incorporates a movable rack with thermocouples that was used to obtain temperature measurements inside the cavity. The rack plane can be moved radially outward from the RPV wall to the gap between the central standpipe and the adjacent one in such a way to have temperature measurements along the cavity height at different distances from the RPV wall, and in the gap between the standpipes. Figs. 1 and Fig. 1 refer to different experimental temperature measurement at the rack plane location 12 mm and 48 mm from the RPV wall, respectively. The figures also show the numerical results for the Realizable two-layer k-ε turbulence model and the LES Wale subgrid scale turbulence model. Since the LES turbulence model requires transient simulations, the LES results were obtained from an average of the instantaneous temperature profiles over a 5 seconds period range, with a sampling frequency of 1000 Hz, which means 5,000 numerical measurements for each location were considered. From Fig. 6 it is possible to see that close to the RPV wall, where very large temperature gradients are present, both turbulence models are in satisfactory agreement with the experimental results. Surprisingly the k-ε model shows a better accuracy than the LES model in the upper part of the cavity where the effect of turbulent mixing is expected to be the dominant phenomenon in the temperature distribution across the cavity. This result is due to the difference in the location of separation and reattachment at the upper RPV wall predicted by the two turbulence models. A very fine mesh in the upper part of the cavity region would be required to accurately predict the location where the fluid first separates from the RPV wall. From the figure it is possible to say that the numerical results are qualitatively close to the experimental data. Some differences are present in the lower part of the cavity. The back radiation of the experimental facility at the cavity bottom wall was strongly reduced by covering the aluminum bottom wall with a very low reflectivity material. The effect is still present as can be seen from the temperature measurements in the lower part of the cavity. The bottom wall has a temperature larger than the air in the cavity region. This implies back radiation in the medium. 7 This phenomenon was not simulated in the CFD model. Consequently, in the lower part of the cavity the experimental data show larger temperature with respect to the numerical simulations. LES predicts slightly lower temperature with respect to k-ε turbulence model in the lower part of the cavity due to the reduced turbulent mixing present in this region (i.e., air is almost at stagnant condition). Fig. 6. RCCS cavity temperature distribution 12 mm from the RPV wall. Fig. 7 addresses the cavity temperature distribution very close to the standpipes wall. The numerical results trend is qualitatively close to the experimental data. From the figure it is possible to see the effect of the main recirculation region across the cavity at about half the cavity height. Cold air moving downwards along the standpipes wall is redirected towards the RPV wall from the stagnant air present in the bottom part of the cavity. This is the reason why a local minimum in temperature is present at about half the cavity height for the numerical analyses. This effect is much less relevant in the experimental data due to the presence of the movable rack plane which strongly modifies the flow pattern in the thin gap between two tubes. Fig. 7. 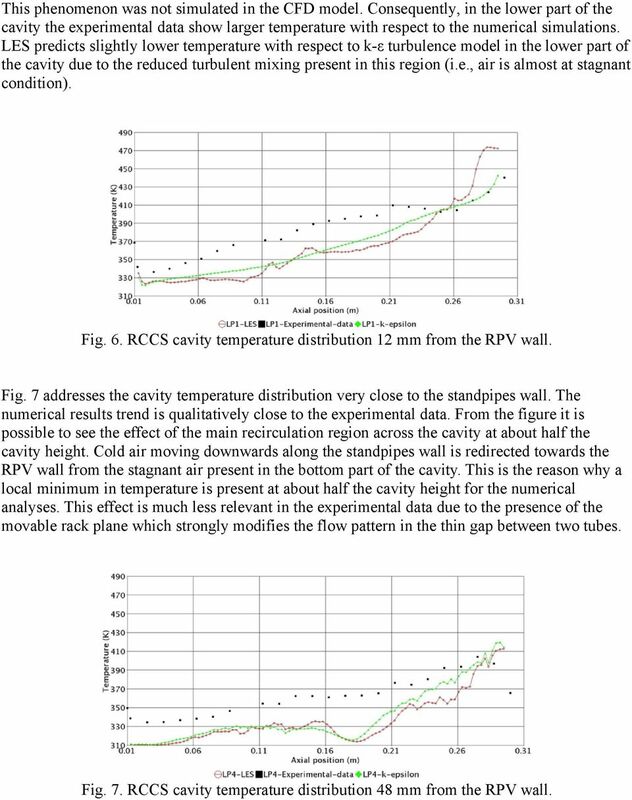 RCCS cavity temperature distribution 48 mm from the RPV wall. 8 In Fig. 8 is shown the numerical results for the temperature distribution at the cavity back wall (rack plane location). No experimental data were available for this position. The very good agreement between the two turbulence models analyzed allows to relay on the results obtained with the Realizable k-ε model with two-layer all y + wall treatment for further analysis of the fluid flow and heat exchange in the RCCS cavity. Fig. 8. RCCS cavity temperature distribution at the RCCS cavity back wall. From the comparison of the experimental data and the numerical simulations, it is possible to conclude that the results obtained with the Realizable k-ε model two-layer all y + wall treatment are considerably close to the LES model results, though the computational effort is three orders of magnitude inferior for the former model. It is worth to note that a relevant fraction of the energy across the cavity is radiated from the RPV wall to the standpipes. The fraction due to radiation being strongly dependent on the temperature gradient across the cavity can be considered of the order of 80%, with free convection making up the balance. In these conditions the effect due to turbulent mixing in the transport of energy across the cavity is less relevant than radiation. Therefore, a faithful representation of the heat exchange across the cavity should be strongly focused on a very detailed representation of the RCCS geometry in such a way to have the right view factors and the effect of turbulent mixing can be safely considered as secondary. Lecture 6 - Boundary Conditions Applied Computational Fluid Dynamics Instructor: André Bakker http://www.bakker.org André Bakker (2002-2006) Fluent Inc. (2002) 1 Outline Overview. Inlet and outlet boundaries. Problem Statement In order to satisfy production and storage requirements, small and medium-scale industrial facilities commonly occupy spaces with ceilings ranging between twenty and thirty feet in height. 4.What is the appropriate dimensionless parameter to use in comparing flow types? YOUR ANSWER: The Reynolds Number, Re. Customer Training Material. Lecture 2. Introduction to. Methodology ANSYS FLUENT. ANSYS, Inc. Proprietary 2010 ANSYS, Inc. All rights reserved. VISUAL PHYSICS School of Physics University of Sydney Australia. Why do cars need different oils in hot and cold countries? A Guide to Calculate Convection Coefficients for Thermal Problems Application Note Keywords: Thermal analysis, convection coefficients, computational fluid dynamics, free convection, forced convection.